Formerly called the Mayor’s Poetry City Challenge, Poetry City is an annual celebration of poetry facilitated by mayors and city councils all across Canada. It’s way to recognize the valuable contribution poets and writers make to the cultural life in the community and to celebrate the leadership of so many of Canada’s council members that promote the arts and literacy through their political platforms. In past years, we have distributed a challenge to mayors across the country inviting them to host a local poet to do a short reading at a city council meeting in March or April. This year, we are expanding the scope of the challenge to bring poetry to more community spaces! Less rules, more poetry! Participating cities can of course still choose to host a poet in a city council meeting. Your mayor, city councilor(s), or Poet Laureate if you have one, could partner with a local arts council or organization, public library, bookstore, community center – the options are endless – and create space for poetry in a new way. Take on the challenge by holding a poetry reading, an open mic night, an interview or panel discussion, a book launch, issue a reading challenge to your council or constituency, a writing group – get creative! There are so many ways to showcase local talent and contribute to your city’s arts community. We challenge you to participate in whatever way most inspires you. The timing of the challenge is set to align with UNESCO World Poetry Day on March 21, and National Poetry Month in April. Poetry City also encourages municipalities to formally declare World Poetry Day and National Poetry Month as a means of bring poetry into the public eye. What is UNESCO World Poetry Day? A decision to proclaim World Poetry Day was adopted during UNESCO’s 30th session in 1999 to recognize the unique ability of poetry to capture the creative spirit of the human mind. One of the main objectives of the Day is to support linguistic diversity through poetic expression and to offer endangered languages the opportunity to be heard within their communities. Find out more by visiting the UNESCO website. National Poetry Month began in the US in 1996, spearheaded by the Academy of American Poets on the steps of a post office in New York City. There, the story goes, Academy staff members handed out copies of T.S. Eliot’s poem, “The Waste Land,” which begins, “April is the cruellest month…” to individuals waiting in line to mail their tax returns. Established in Canada in April 1998 by the League, NPM now brings together schools, publishers, booksellers, literary organizations, libraries, and poets from across the country to celebrate poetry and its vital place in Canada’s culture. Find out more about National Poetry Month at poets.ca/npm. How can poets celebrate Poetry City? 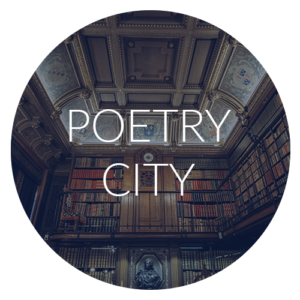 If you are a poet interested in celebrating Poetry City, the first step is to find out if your city is a confirmed participant! An updated list of Poetry City participants can be found at poets.ca/poetrycity. If a city is not yet participating, we encourage poets to approach their city council and let them know about the challenge. The League is happy to send a physical challenge package to any communities that didn’t receive one! Email info@poets.ca for requests or questions. My city/town didn’t receive a challenge package; can we still participate in Poetry City? Yes! All Poetry City materials are available at poets.ca/poetrycity, and the League is also happy to send out a physical challenge package to any municipalities that didn’t receive one but would like to participate. Email info@poets.ca! How should my city select which poet(s) should read for our Poetry City event? If your city has a Poet Laureate, we encourage you to invite them to read with another local poet—they might even have a recommendation! You can reach out to publishers in your area, as well as libraries and creative writing programs. You can use the League member directory to search by province. Should all these resources fail, or provide too cumbersome, we recommend contacting your provincial writers’ association! We confirmed our participating and we have a poet—what now? The specifics of the evening are up to you! Most cities invite the poet to read at the very start of the council meeting, for anywhere from 3 to 15 minutes. We do recommend compensating poets for their time, although this is not a mandatory element of participation in Poetry City. As a point of reference, with the support of the Canada Council, the League provides poets who apply to our funding program with an approximately $100 honorarium for readings around 15 minutes long. As we mentioned, we have broadened the scope of possibilities for what Poetry City 2018 can look like! If you’ve got an idea and would like some feedback, feel free to email info@poets.ca with your proposal. Get as creative as you want!